The battle for Marawi City has raised concern that ISIS, on a back foot in Syria and Iraq, is building a regional base on the Philippine island of Mindanao that could pose a threat to neighbouring Indonesia, Malaysia and Singapore too. A joint group of police and military forces on foot patrol as part of clearing operations. Marawi, Philippines: The ISIS terrorists holed up in the southern Philippines town of Marawi have been reduced to a "small resistance" after troops crippled their logistics and some fighters have fled from the battle, military officials said on Thursday. "In a few more days it could be over," armed forces Chief of Staff General Eduaro Ano told ANC television on the 17th day of a siege by hundreds of terrorists who have sworn allegiance to the ultra-radical ISIS. Officials have said that, among the several hundred terrorists who seized the town on May 23, there were about 40 foreigners from Indonesia and Malaysia but also fighters from India, Saudi Arabia, Morocco and Chechnya. The seizure of the town suggested to many that pro-ISIS factions wanted to establish it as a Southeast Asian "wilayat" - or governorate - for ISIS, a fear reinforced by video footage the military found last week showing the fighters plotting to seal the town off completely. 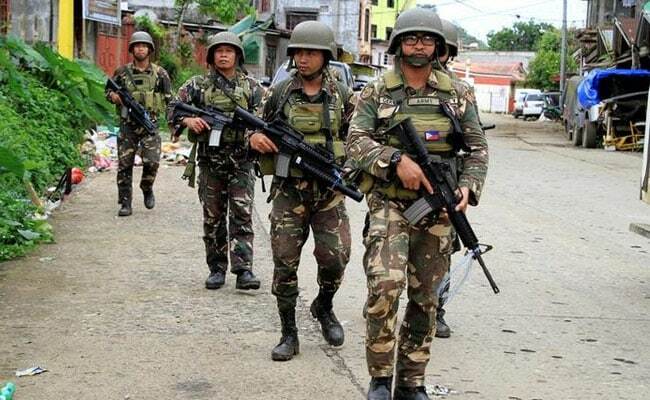 Major General Carlito Galvez, head of military command in the region, said government troops had entered three neighbourhoods from which the terrorists had pulled back after two weeks of defence that relied heavily on snipers. "We saw food, IEDs, mobility assets. Considering we have paralysed logistics capability, we are looking at the possibility that the end will be near," he told a news conference in Marawi, referring to improvised explosive devices, or bombs. With their ability to fight "degraded", some of the terrorists have fled, military spokesman Restituto Padilla said in a radio interview, adding that nine had surrendered and were providing "good intelligence". The government has said several times that it is close to retaking the town from the Maute group. A relatively new rebel faction, it joined forces with Isnilon Hapilon, who was last year proclaimed by ISIS as its "emir" of Southeast Asia. But the fighters prepared for a long siege, stockpiling arms and food in tunnels, basements, mosques and madrasas, or Islamic religious schools, military officials say. The Philippines is largely Christian, but Marawi City is overwhelmingly Muslim. The military said 138 terrorists had been killed, and the death tolls for security personnel and civilians stood at 39 and 20, respectively. Galvez said the military believed that "more or less 100" civilians were still being held hostage by the terrorists. Earlier this week, officials put at several hundred the number of people being held as human shields or trapped in their homes. Catholic priest Father Teresito "Chito" Soganub and about a dozen of his parishioners were abducted on the first day of the siege when terrorists burst into the town's cathedral and then set it on fire. Task force head Brigadier General Rolly Bautista told reporters that, according to information passed back through emissaries, the priest was still alive. The government has been setting up "peace corridors" to allow civilians from the lakeside town to move away from the battle and to deliver food and medicines. Government-appointed negotiator Irene Santiago said that a religious leader who had been acting as an emissary to seek a corridor for civilians held hostage had taken ill and the authorities were waiting for him to get better. Philippine Journalist Maria Ressa Arrested Again, This Time For "Fraud"